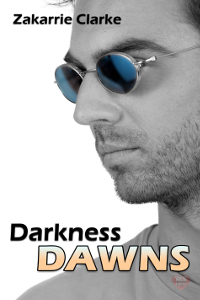 Darkness Dawns is a love story. It also tells the tale of one man's war with himself, brought onto the battlefield of his blindness. Leo Ferrar suffers from diabetic retinopathy and lost his sight two years ago. Unable to bear the scrutiny of strangers or the impact of his blindness on those he loves, Leo has determined on shutting the world out ever since. This is the man Ben meets on his first day at work as Mr Ferrar's care assistant. A former heroin addict, Ben was sentenced to six months community service as punishment for his crimes by a judge entitled to condemn him to a seven-year stretch. Far too charming for his own welfare, Ben soon proves unaccountably brilliant at 'bulldozing the blind'. When fate sees fit to dispatch Ben to the home of the man he has internally dubbed Mr Ferrarcious; it is with the words of the last five unfortunates who'd dared darken Leo's doorway ringing in his ears. A door that is opened by a man who might be Lord Byron himself. Drop dead gorgeous and as hot as hell, Leo Ferrar has the most beautiful eyes Ben has ever seen.